Here at Convince & Convert Media, we produce three podcasts. Most frequent is my nearly-daily video show Jay Today (read this post to see how we make 8 pieces of content out of each episode). 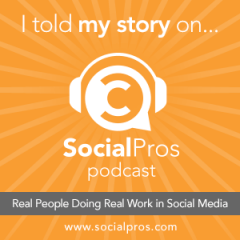 We also produce Social Pros, the podcast for real people doing real work in social media. This show is in its fourth year, and new episodes are launched weekly. Our newest addition is Content Pros, where the tips and tricks of the world’s best content marketers are revealed. That show releases two new episodes per month. All of these shows (and 550 more) are rated and reviewed at our MarketingPodcasts.com site, the first search engine for marketing podcasts. We’ve been producing podcasts for quite a while, so I wanted to provide this checklist of some of the steps we take that might help make your podcast better and easier to get on the air. We almost always record two shows back-to-back. It took me a while to figure this out, but it’s easier to schedule one, larger chunk of time than a few, smaller chunks. Plus, when you’re “in the flow” the shows are just better. I very much recommend setting aside 2-3 hours every couple of weeks, and knocking out as many podcasts as you can. Our show hosts (me for Social Pros; Amber Naslund and Chris Moody for Content Pros) pick and schedule their own guests. We do it the old-fashioned way, via email. I know there are lots of tools out there that help you pick and time and auto-schedule, but I hate the impersonal nature of that technology. You’re asking someone to come on your show, can’t you at least exchange a couple of emails to pick a time? Once guests are arranged, our Producer, Jess Ostroff, sends a GoToMeeting invite to guests and hosts. We record our shows via GoToMeeting, which we prefer to Skype. When she sends the GoToMeeting request, Jess also sends to the guests our guest guidelines for the podcast, so they have a better feel for what’s going to happen while recording. Here’s our guest guidelines page for Social Pros. At this stage, Jess also gets the mailing address for the guest. Why? Because…. We want guests on our podcasts to be treated like somebody special (because they are! ), and we want the audio quality of the shows to be as good as it can be. We now send all guests a USB headset and a thank you note, via Amazon. Here’s the headset we send to guests. Does that expense add up? Sure it does. We’ll send at least 75 of those headsets in 2015, so the annual cost for this piece of our podcast production checklist is nearly $2,000. But, we’re always trying to raise the bar and differentiate. It’s worth it (to me). Our hosts research all guests before the show, but we recently created pre-show interview questionnaires so that we can pull more knowledge and insights from guests before the podcast begins. This is inspired by the “pre interview” that is done on talk shows. Here’s the pre-show questionnaire for Social Pros. We built it in 5 minutes using Formstack, a fantastic form and landing page creation tool (with testing). Formstack is also a sponsor of the Social Pros podcast (and this blog), and you can get a 14-day free trial right here. When the guest completes the form, the answers are automatically sent to our hosts, and our producer. As mentioned, we use GoToMeeting to record Social Pros and Content Pros. It’s just easier for us, and we find the audio to be slightly more stable than Skype. However, we do not use a mixing board or any advanced audio techniques, and it is my understanding that Skype may be superior in that configuration. After each episode finishes, our primary host converts the recording using the built-in tool inside GoToMeeting, and uploads it to Dropbox. We send a notification email to our producer, and provide her with a proposed title for the episode. During the show, we have host-read commercials for our sponsors. Our producer logs new advertiser copy on a Google doc, and that file remains on our second monitor during the episode taping. We do not read the commercials word-for-word, but try to make them as organic to the show as possible. Chris Moody and Amber Naslund are particularly good at this on the Content Pros podcast. Each podcast episode contains three or four sponsor acknowledgements. Social Pros sponsors include Salesforce Marketing Cloud, Formstack, Shortstack, and Cision. Content Pros sponsors include ProofHQ, InboundWriter, Oracle Marketing Cloud, and Sysomos. We only work with sponsors I believe in personally, which is why all of our current partners are either platforms we use at Convince & Convert and/or consulting clients. We do not do comprehensive editing on our podcasts, preferring a more authentic vibe. We use Levelator to make sure the hosts and guests are at the same audio level, and we cut out obvious flubs and delays. Our producer Jess also inserts our pre-recorded show opens and closes. We use Jack at Audiobag for these recordings. Once the episode is edited, it as added to our hosting platforms. We use Podbean for Social Pros and Libsyn for Content Pros. Once added there, the episodes are automatically added to the shows feed on iTunes and other aggregators like Stitcher. At this point, we also upload the finished audio to Speechpad, a terrific transcription service we use to get word-for-word transcripts of all shows at approximately $1 per minute. Here’s a finished Social Pros podcast, featuring Adam Buchanan from Cabela’s. Here’s a finished Content Pros podcast, featuring Jason Miller from Linkedin. Speechpad sends a notification email when the transcription is complete. Our producer then takes the best moments from the episode and creates a blog post that runs here on Convince & Convert. At one point we ran full-text blog posts, but those got to be long, so now we just write up the highlights. All the blog posts for Social Pros (150+) can be found here. The Content Pros blog posts are located here. These videos are uploaded to Youtube and Facebook, and are embedded in the Content Pros blog post. The day the show goes live, our producer emails guests to let them know, and encourages them to share the episode. We also send guests a digital “badge” that they can use on their personal website or blog. Stephanie is also sending via FedEx the finished, giant poster of the episode’s visual notes to each Content Pros guest. A nice touch, I think. Our podcasts are now released on Mondays. We promote each episode across our social channels, the social channels of our hosts, and in our daily email The One Thing. We also have an ongoing retargeting campaign using Google display ads. So, if you’ve ever visited a Social Pros or Content Pros blog post, the chances are pretty good that you’ll sometimes see ads for new episodes on websites all around. Our team updates the creative each week to feature the new guest. It’s terrific to have consistent audio content from the podcast, as well as weekly blog post summaries of each shows. But, we try to create even more content out of our podcast program with our monthly recaps/greatest hits posts. Here’s a monthly recap from Social Pros, focused on the human side of social. We also sometimes create special content marketing programs that use our podcasts as raw materials. For example, our Social Pros All-Stars ebook we published in 2014 tapped into the education and career histories of podcast guests, and became an ebook and a media hit. See the Social Pros All-Stars ebook on Slideshare. It’s called Lessons from 27 Big-Brand Social Media Professionals. So that’s it. 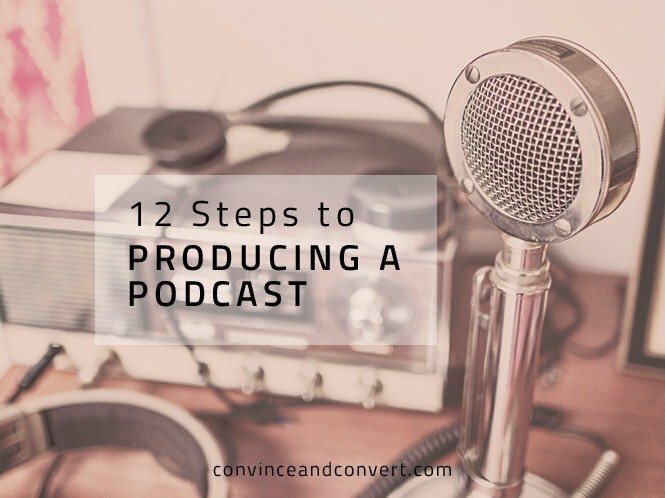 That’s our 12-step process to produce a podcast. I hope it’s useful to you. Don’t forget, we are looking to produce more shows, so contact us if you’re interested. And lastly, take a look at our MarketingPodcasts.com site, and the first and only search engine for marketing podcasts.